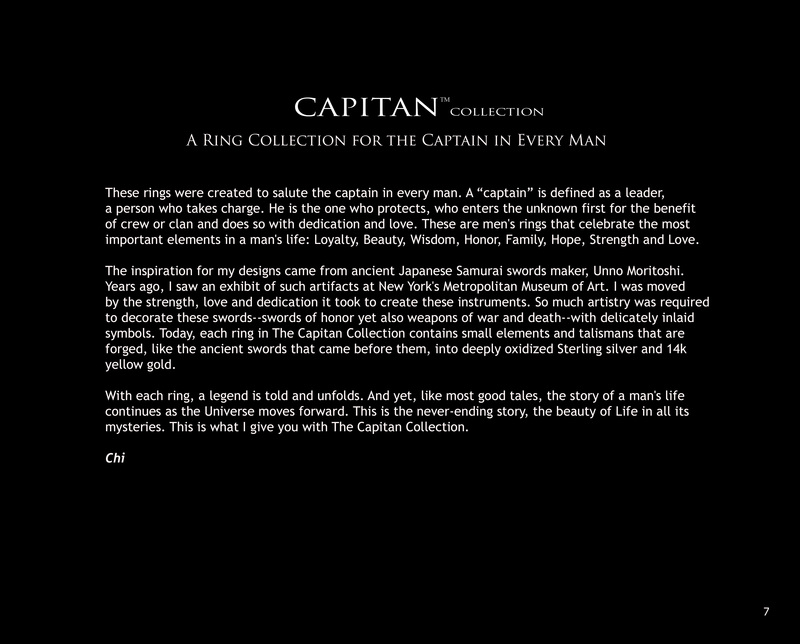 These rings were created to salute the captain in every man, celebrating the most important elements in a man's life: Loyalty, Beauty, Wisdom, Honor, Family, Hope, Strength and Love. 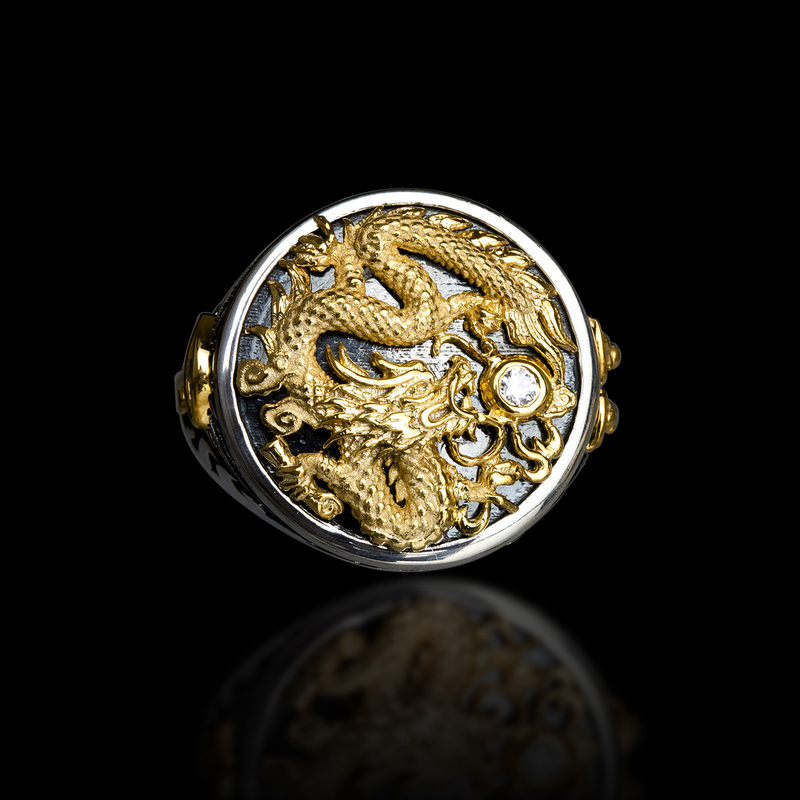 With each ring, a legend is told and unfolds, containing small elements and talismans that are forged, like the ancient swords that inspire them, into deeply oxidized Sterling silver and 14K yellow gold. A key with an eye-shaped head and two “L” letters. A book of wisdom with a seed, a plant and a flower. A dragon with a secret scroll in its talons. A key symbolizes the freedom to unlock anything that stands before us. The head of the key is in the shape of an eye, and this eye holds the Earth. We look through our eyes but not many can see. The world exists only through our perceptions. Therefore, the love, hate, happiness, sorrow, beauty and ugliness in the world only exist in our eyes. We decide which of these things we want to see. 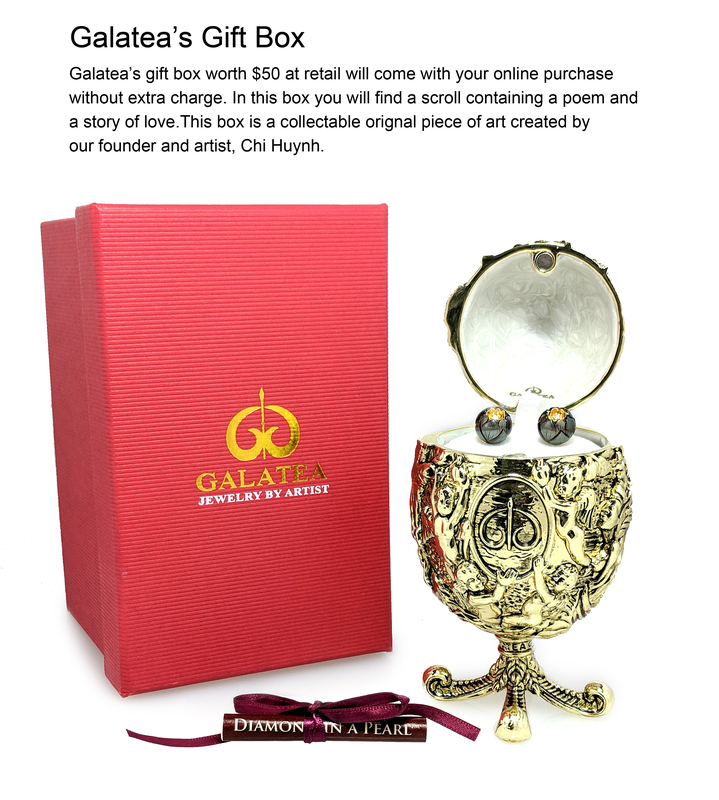 The book symbolizes knowledge and wisdom. There is so much knowledge from the past that one can easily suffer from intellectual greed. But the secret of life is in the seed. The seed does not know that it will become a tree. A tree does not know that it bears flowers. And a flower does not know that it will give rise to fruit and seeds. The new seeds continue the circle of life. They have no past or future. This is life itself unfolding through the seasons, fearlessly being and becoming. 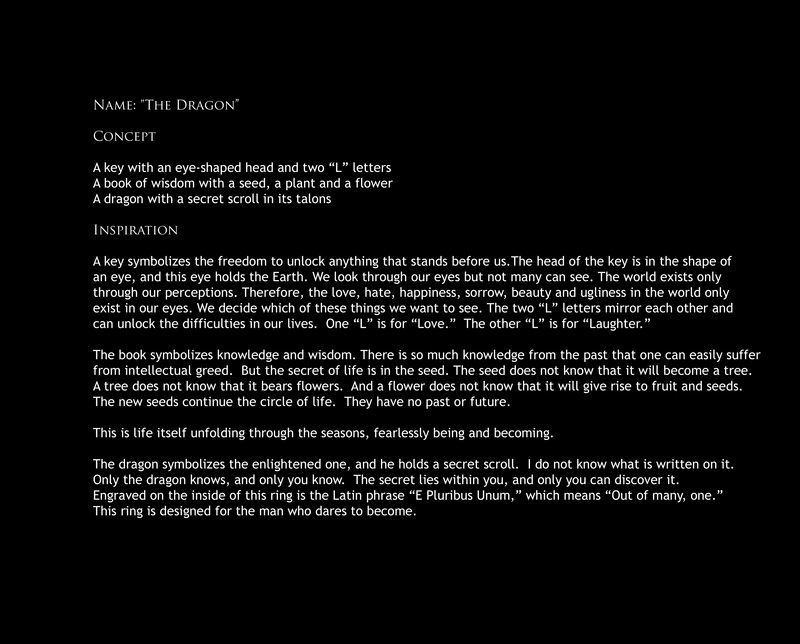 The dragon symbolizes the enlightened one, and he holds a secret scroll. I do not know what is written on it. Only the dragon knows, and only you know. The secret lies within you, and only you can discover it. 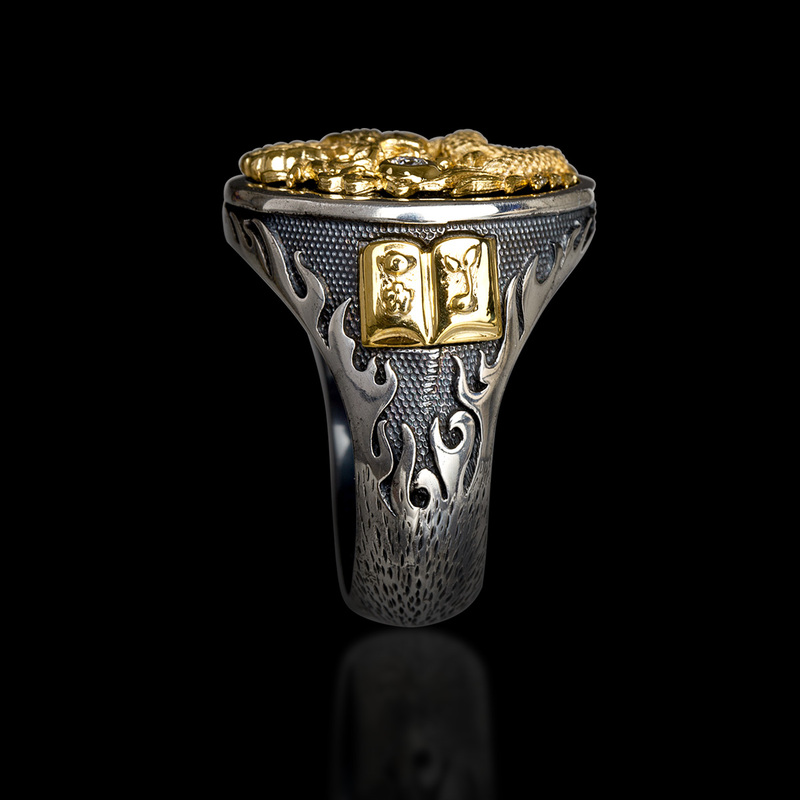 Engraved on the inside of this ring is the Latin phrase “E Pluribus Unum,” which means “Out of many, one.” This ring is designed for the man who dares to become. 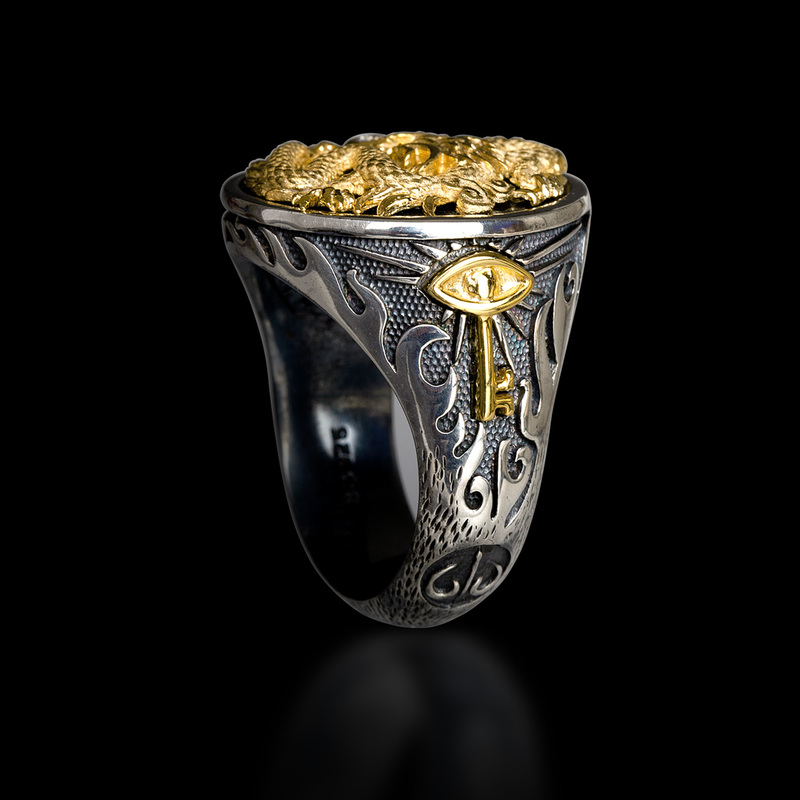 Oxidized Sterling silver ring with 14k yellow gold accents.